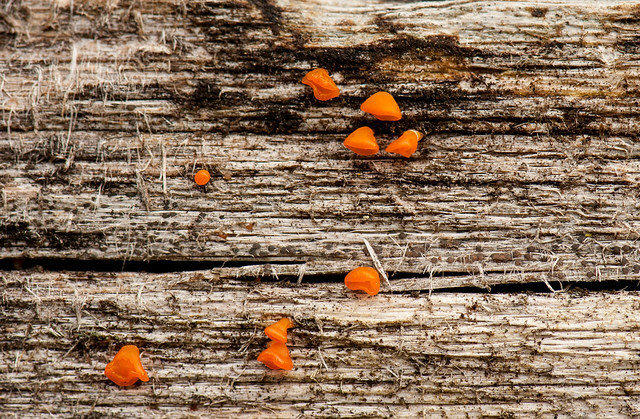 Yesterday in the park, I noticed this jelly fungus sprouting on a fence. It was hard not to see the bright orange on the old fence, and I saw it on a couple of logs as well. Apparently conditions were just right for a bit of sporulation. I guess it’s not really ‘occasional life in the forest’. The fungus would be there all year. What I noticed was the fruiting body; the rest of it is feeding inside the wood. You can almost hear the trees wishing for an end to winter. I worked for many years as biologist, and much of the work was driven by conifer reproduction cycles. We’d start the year in February to early April, with cedar and Douglas-fir ‘flowers’ on southern Vancouver Island (roughly 148N, 123W). From there, we’d move into the southern interior by May, for spruce and pine around Salmon Arm and Vernon, BC (roughly 50N, 120W). By June, the lodgepole pine near Prince George (roughly 53N, 122W) was shedding pollen and the cycle for us was complete. It was a busy time, only to be repeated in in reverse during the fall, as cones matured and prepared to shed their seed. That cycle is just starting now. The alder tree catkins around here are hanging out, ready to explode with pollen as soon as temperatures and daylight are just right. Even the undergrowth is forming up leaf buds that are set to burst open in the next month or so. I’ll bet you could find some flower buds at the top of the local Douglas-fir trees as well. 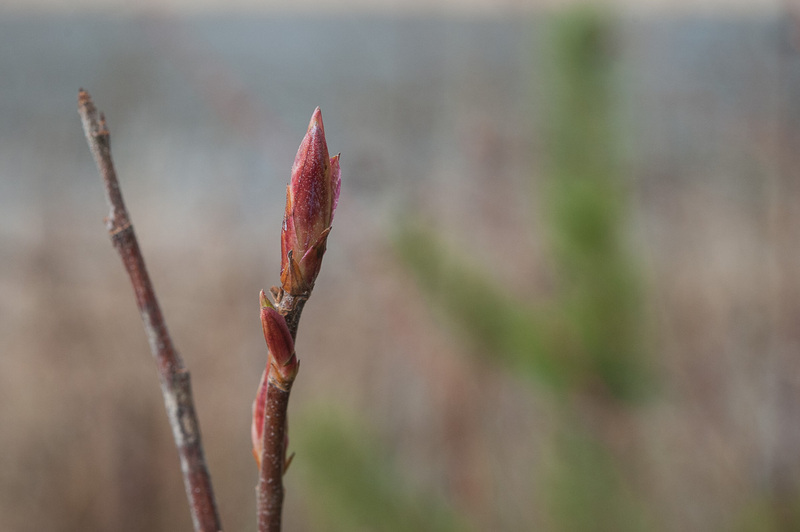 First signs of spring in the local forest. Spring can come early on the south coast of BC, and the first signs are popping up everywhere. I went on an outing the other day, toting my D700 and a 60mm micro lens. I’ve been shooting with my iPhone a lot lately, so it was a nice change of perspective. These sporophytes are sticking up on the piles of moss growing on a fence at Green Timbers Park. 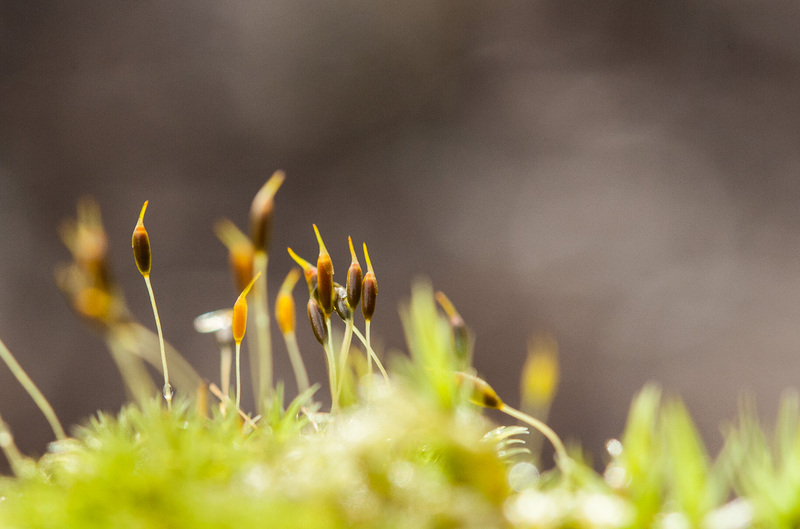 Lately, the moss seemed more ‘perky’ and alive, and when I took a closer look, I could see the capsules forming on little stalks above the leaves. Definitely a first sign of spring on this wet coast. Managed to get out for a couple of hours on Saturday, so I poked around City Hall for some pictures. Quite a few daffodils and early flowers breaking out, and looking very colourful, given that most of the place was still tucked in for winter. I did find this plant with its undecided leaves. Not sure if it is a usual thing, but the two tones seemed odd. I’m use to dark and lime green as leaves mature, but green and brown? Interesting. Must learn more. Judging by the expanding buds on most of the trees, it won’t be long until everything is out in bloom here on the wet coast. I pushed myself off the couch on Sunday morning and headed out to the area around the Boundary Bay airport to take some pictures. What luck. An instant lawn company was mixing up some compost that smelled like rotting chicken manure. I guess either that, or the rats and mice they were disturbing in the piles had attracted a bunch of eagles (do eagles flock?). 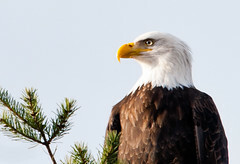 The eagles would spend a few minutes fighting for territory with the seagulls and crows, and then they’d head off to various trees to rest. Some gathered together with others; some chose to perch on their own. Anyway, I spent about an hour watching them and taking pictures. I used my Nikon D300 and a Sigma 120-400 lens. When I could, I braced it against the side of the car, but other times that wasn’t possible. 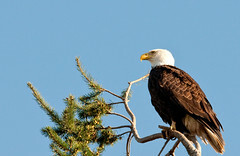 This picture of an eagle in a tree was the first I took and it was handheld. The rest varied substantially in sharpness – too much coffee before I left, I guess. Tracking and panning proved too much. Everything I took was really blurry. I’ll have to experiment some more with that. Glad to see some sunshine. The day had a cold wind, but at least the morning was bright. According to Business in Vancouver (pay wall link) last week (August 22-28, 2006), a BC seedling producer is in the news (link is dead). The company is talking about using their biotech product to help BC’s forests recover from the losses caused by the Mountain Pine Beetle. We’ll need lots of trees to do that, and the company could ramp up production pretty fast. Still, I expect they’ll get some pushback from the very foresters they hope to help. And unless they’re careful, the company will run into lots of opposition from the public – can’t be helped with a production process with the unfortunate name of somatic embryogenesis. Of course, if you introduce genetically engineered material, that’s what you get in the callus. Many scientists hail the process as being a great way to beef up numbers in transgenic tests. But most of us won’t like that for forestry use. The thought of engineered trees from labs lends itself to all kinds of imaginative meanderings. I’m sure there would be a big push back on the idea, and not just from environmentalists. I think the producer knows that. I suspect the Ministry of Forests wouldn’t like it either. Their own excellent geneticists argue that because of the diverse BC ecology, our forests contain a lot of genetic variation. We can breed trees to suit and keep a lot of the natural variation intact. Why alter the tree’s genetics. It might make some sense in private timberlands down south; it doesn’t make sense in BC’s public forest. I think the producer knows that too. Actually, back in the 1990s I had a hand in developing nursery practices for somatic seedlings of interior spruce. The material came from regular seed, from normal trees. We affectionately called the plantlets ’emblings’ (from embryos), rather than seedlings (from seed). Actually, we went as far as trying to take rooted cuttings from older emblings too. Heh, we called them stumblings (aka stuck emblings, ’cause you had to stick the cuttings in peat to get them rooted). That term didn’t (ahem) stick. I also helped set up some of the initial plots to test the growth of emblings in the forest. There was a lot of concern about long term performance, as well as with maintaining genetic diversity in the resulting crop. After all, the research lab had only selected a few original seeds from a few original trees. All the technology the young plantlets were subject to, from callus formation, through lab extraction, through nursery, could easily result in some selection too. Those plants that could endure all the manipulation survived. Those that couldn’t endure didn’t last. Was there enough diversity in those that were left? How were we to deal with that? Were the original trees the ones we wanted to be using as ‘parents’ for these new trees? Did the original seeds represent the ‘parents’ good traits, or were they going to produce the sickly runts of the family? So many questions were being asked that the Ministry of Forests decided to wait. They wanted the answers from field testing before allowing emblings for reforestation programs. And of course, any genetic trickery was out of the question. The cost was also an issue. I expect it’s has come down with time, but back then a finished embling cost 60 cents to $1.00, depending who you talked to. That was expensive when most seedling costs were below 40 cents. The cost will have to be comparable if foresters are going to consider planting them over large areas. Buying and planting seedlings is a big cost consideration in reforestation. Those were some of the issues early on, and I expect things haven’t changed too much since then. Transgenics aside, the technology has some niche uses, but the research results are not in for wide scale forestry use. Most of the test plots are not even 15 years old yet. The trees are just getting started. Without those test results, I doubt we’ll see any large scale production of emblings for reforestation in BC anytime soon.